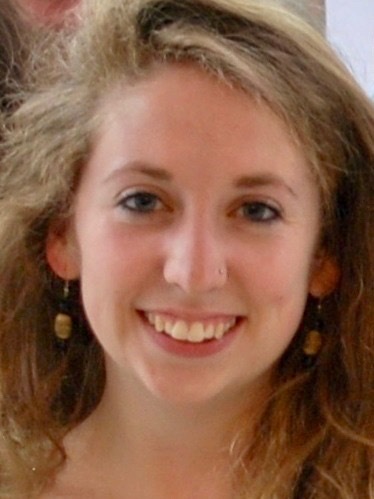 Sophie Keane is a member of The Reporters Inc.’s Board of Directors. To learn more about her, click here. Early in the morning on a recent Friday in St. Paul, Minnesota, young single mother of three Dee Pray waited in the backyard of a seemingly ordinary house. “It’s getting cold,” Pray said with a knowing smile. She pulled a pink felt hat over her ears. About 30 others waited in line with her. Some wore parkas over long hijabs. Others squatted on the lawn and wore thick socks with simple leather sandals. This particular house happens to be the home of MORE, an organization dedicated to helping refugees and immigrants with the education and support they need to become fully engaged members of the community. For more than 30 years, MORE has offered English language training, assistance in applying for health insurance, and employment counseling. On Friday and Saturday mornings, it gives away donated groceries and household items. Most of the people in the grocery line on this particular Friday were people from Bhutan, Somalia and, like Pray, Myanmar (formerly known as Burma). They are among the estimated 25.4 million refugees around the world today who have been forced to leave their home countries due to war, persecution, or natural disaster. Pray was able to come to the Minnesota three years ago from a refugee camp in Thailand. With the help of United Nations High Commissioner for Refugees (UNHCR) representatives at the camp, Pray filed a case for resettlement with what’s called a Resettlement Support Center (RSC). The RSC gathered biographical information about Pray and her family and then forwarded her case to the U.S. Department of Homeland Security, which then interviewed her and screened her for diseases like tuberculosis. Finally, the UNHCR connected her with a refugee resettlement agency in Minnesota which booked her flights, found her housing and welcomed her and her children. Pray fled a violent war for independence that members of her ethnic group, the Karen, have been fighting against the government of Myanmar since the 1940s. To protect herself and her family from state-sponsored killing of the Karen Pray fled to the camp and lived there for nine years. Compared to most, that’s a short stay—the average length of time spent in a refugee camp is 17 years. “Last year I was really sick,” she said, describing a genetic condition unrelated to her time in the camp. She crossed her arms. “Like, really sick. I almost died. I lost so much weight, I couldn’t move. Despite the urgent need for resettlement agencies and refugee social service organizations like MORE, major cutbacks to the number of refugees admitted to the U.S. as a result of the Trump administration’s restrictive immigration policies are causing anxiety among both workers and clients. One of the five federally-funded agencies in Minnesota, Catholic Charities, already shut down its refugee resettlement services in May of last year “due to restrictive federal policies limiting the number of refugees entering our country,” according to an official statement from the organization. Nationwide, the system of government and nonprofit agencies that composes modern refugee resettlement programming has never been smaller in its 28-year history, despite conflicts in Syria, Afghanistan and South Sudan (countries with the highest reported number of refugees). The situation has incited the worst refugee crisis the world has ever seen, according to UNHCR. Immigrants and refugees in St. Paul, Minnesota line up for groceries and other household goods offered by MORE, an organization devoted to helping newcomers to the U.S. resettle. While MORE isn’t funded by the federal government like Catholic Charities, it also came dangerously close to ceasing to exist. In October of last year, MORE sent out a message to clients and staff that it would have to close its doors for good. But at the end of November, MORE received an anonymous $50,000 donation that will allow it to stay open for at least another year. Its long-term future—and that of all organizations that provide services to refugees in the U.S.—is still uncertain. At 8 a.m. sharp on that Friday, Patrick Robbins, the social services program manager at MORE, unlocked MORE’s back doors and greeted Pray and others in their native Karen. He spoke to some clients in Nepali and Spanish as well. Robbins spent four years in Nepal and speaks the language fluently. He’s picked up words in other languages after years of working with people who speak them. Robbins believes that making an effort to learn at least a few words in his clients’ native tongues goes a long way in building trust. “Someone immediately sees that you respect their language and culture enough to learn at least a little bit,” he said. Even before Catholic Charities closed, Robbins said the services offered to new arrivals in Minnesota weren’t enough. Anyone adjusting to a new country faces challenges, but people arriving with refugee status have usually experienced extreme trauma, and even mortal peril, he said— factors that enabled them to attain refugee status in the first place. Cathy Rucci, the executive director of MORE, believes that new arrivals need holistic services for longer than they are allotted by the federal government. The “resettlement period” for refugees, during which they receive federally funded assistance, only lasts for three months. Rucci had been prepared to close MORE, before the arrival of the anonymous donation, in part because of a significant decline in program participants. In 2016, Minnesota welcomed more than 3,000 refugees. In 2018, that number fell to 671. Since many people with refugee status arrive in the United States with little to no exposure to English, they come to a language school for adults, or an Adult Basic Education (ABE) program, like MORE. 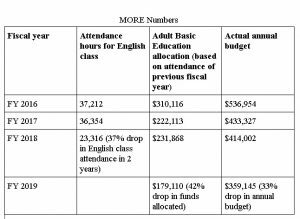 ABE programs receive state funding, but the amount is dependent on attendance hours from the previous fiscal year. With fewer newcomers arriving, attendance numbers are dropping in beginning English classes like those MORE offers. For MORE and other English schools like it who rely on the state funding from these numbers, that could mean fewer services for everyone. “When we had such a significant drop (in our English class attendees), which affects how we’re reimbursed, I knew that we were going to have to take a serious look at our service delivery, and figure out if we would be able to maintain operations until there’s a new (U.S. presidential) administration,” Rucci said. The President of the United States sets the number of refugees admitted to the country every year. For most of the last 15 years, the “refugee ceiling” has been set at around 75,000 people. In 2017, shortly before leaving office, President Barack Obama raised the ceiling to 110,000 people in order to respond to crises in Syria and other parts of the world. But in 2018, President Donald Trump lowered the ceiling to 45,000 people. Only 22,491 were actually admitted last year. In 2019, the ceiling is set at 30,000. Regardless, Robbins said that the need to provide refugees with food distributions, and to help with health insurance and other social services, hasn’t diminished despite decreased English attendance. The White House slashing of refugee resettlement programming has also had a ripple effect on private funders of organizations like MORE. One of MORE’s main funders decided to withdraw its support this past fall. “I was told that our trustees were concerned about the financial viability of our organization in the current political climate,” Rucci said. That’s when she prepared to close MORE’s doors. Rucci was jarred by the turn of events but not surprised. Since the current administration has been in power, cuts to legal immigration have been expansive and varied—from Trump’s Executive Orders in 2017 banning travel from certain countries with high Muslim and refugee populations like Somalia, to former attorney general Jeff Sessions’ policies set in June 2018 that add to the qualifications those seeking asylum need to meet (effectively ending the possibility that those fleeing gang or domestic violence might obtain asylee status). Babita, a volunteer with MORE during its Friday morning food distributions, preferred to use her first name only—given the politicization of her refugee status in recent months. Not long ago she was in much the same situation as the people in line: a refugee newly arrived to Minnesota, who had never had the opportunity to learn English before touching down on U.S. soil. Babita adorns her forehead with a red bindi and wears a gold nose ring. On this morning she stood at the kitchen counter with Robbins, holding a clipboard for people to sign. MORE is one of the only places in Minnesota where Nepali speakers from Bhutan, like Babita, can find help from people who speak their language. “I didn’t speak anything when I arrived,” Babita explained. Today, she speaks fluently and easily. Her son, who was five years old when they arrived, is 11 now and in middle school. He still calls program manager Robbins “Uncle” in Nepali. In addition to English, Babita learned how to drive and earned her license with help from MORE’s staff. She also took a class to prepare her to take, and pass, her citizenship test. Babita is a volunteer with MORE, a St. Paul, Minnesota organization dedicated to helping refugees and immigrants with the education and support they need to become fully engaged members of the community. Other organizations use professional interpreters or have staff who themselves share experiences—and languages—with the refugees and immigrants they serve. 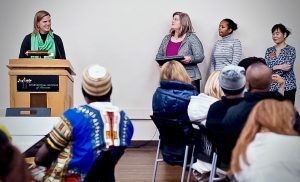 The International Institute of Minnesota is one such organization, one of the now four federally-funded volunteer agencies that resettles refugees in the Twin Cities. 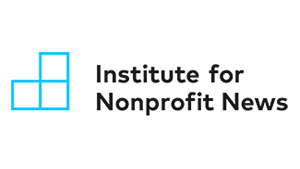 The International Institute is the only Twin Cities agency without a religious affiliation. At the Institute, staff members speak Somali, Swahili, Oromo, Amharic, Spanish, French, Karen, Tigrinya and other key languages (though not Nepali). Unlike MORE, the Institute has a contract with the State Department’s Bureau of Population, Refugees and Migration, or PRM. PRM announced a “fifth quarter” for fiscal year 2018 while it made decisions on where to invest its now limited funding. It has since decided to continue to fund all agencies, but the offices on the ground will now have to make some tough decisions on their own. For some, the drop in numbers will no longer justify the existence of a refugee resettlement department. The International Institute will not be among them—it has already been granted a contract for the upcoming fiscal year. RCA is a federal program focused on finding employment for single adults and couples within their first five months of arrival in the U.S. RCA participants in Minnesota receive $360 a month — an increase from 2017 thanks to a bump in Minnesota state funding. Some states allot as little as $180 a month to recipients of RCA. Mama said that her clients tell her stories of family back home and how the cuts to refugee programming will affect them. She has worked hard to make the program work as effectively as possible for those who do get to come build a life in the U.S.
Institute workers provide services from the moment refugees touch down at the Minneapolis/St. Paul Airport. They support people as they seek work, go to college and advance in their careers. For its Medical Careers Pathway program in particular, the Institute was selected by peer organizations for a statewide 2018 Agency Innovation Award from the Minnesota Resettlement Programs Office. The Institute specializes in preparing people—with English classes, job training and counseling—to become certified nursing assistants and registered nurses. Brooke Anttila, of the International Institute of Minnesota, talks to medical career advancement students at their graduation. Many are overcoming significant barriers in order to do so. “We have a client going for her doctor of nursing practice degree,” Anttila said. “But she’s below 200% of the poverty level (earning less than $24,280 a year) with what she currently makes as a registered nurse, because she’s working limited hours so that she can pursue this degree.” This particular student came to the U.S. in elementary school as a refugee and worked every position at her local hospital—from washing trays and doing housekeeping, to working in the kitchen and assisting nurses—before becoming a registered nurse. In addition to economic challenges, students face outright racism as they navigate higher education in the U.S. “You’ll hear students saying, ‘I know about that school, and they’re not going to accept us,’”Anttila said. Anttila also recently helped some of the Institute’s students file a discrimination suit when, she said, a teacher at a Minnesota college was being overtly racist. During a one-on-one clinical skills test in which students mock-demonstrate the carrying out of an important nursing procedure, this teacher claimed one of Anttila’s students hadn’t mimicked washing her hands (a must in the world of patient health care). Anttila’s student asserted that she had. But the teacher, with a smug smile on her face, looked at the student and announced that she had failed. The student started the investigation process. “Ultimately, the decision maker said that there was not enough corroborating evidence. It was the student’s word against the teacher’s,” Anttila explained. “But the next semester that same teacher made a racist comment in front of a whole class,” Anttila continued. “The student body president was in the class. She stood up and said ‘you can’t say those things.’” The student body president’s comments led to the teacher being escorted off campus and fired. For the students who initially filed the claim, this was a “bit of a slap in the face.,” Anttila said. The student body president was a white woman from Minnesota and her word seemed to count more than theirs. Nonetheless, the students believed that the college ultimately did the right thing. Anttila grew up in rural Minnesota herself and said while there’s a physician shortage there, some small-town state residents question their doctor’s competency if he or she speaks English with an accent. “A doctor or nurse with a medical degree from outside the U.S. just needs a chance to get back into their field, and it sounds like a perfect fit. But there are all these layers that complicate that,” Anttila explained. A student in one of the Institute’s college readiness classes recently broke down while giving a presentation about her home country. A photograph she was showing the class unexpectedly triggered a post-traumatic stress disorder (PTSD) episode. Another student in the class got up and held the presenter until she calmed down. In addition to what’s happening abroad, the Trump administration’s restrictive immigration policies are also increasing anxiety. A new rule recently put out by the Department of Homeland Security, if implemented, would allow border and consulate officials to discriminate based on their perceived belief that an applicant would be likely to access certain public benefits upon arrival. Said differently, those who are poor, elderly and/or disabled might be barred from immigrating to the U.S. A decision will be made whether or not to officially start implementing the rule in the coming weeks. The administration also ordered an end to the DACA (Deferred Action for Childhood Arrivals) program in September of 2017 that allowed for people who had been born outside of the U.S., but brought here as children, to continue to work and study in the country where they were raised. According to the Immigrant Law Center of Minnesota, a nonprofit legal agency that supports low-income immigrants and refugees, no new DACA applications have been allowed. More than 20,000 people have lost their status. While some states (California and New York, for example) have challenged the ruling in district courts, immigration arrests in Minnesota increased 67 percent in 2018, the third largest rate hike in the U.S.
“That fear has been palpable when we meet with clients,” Anttila explained. In addition to healthcare, students at the International Institute and at MORE contribute to life in Minnesota across a number of crucial fields—from manufacturing and childcare, to custodial services and community leadership. Nafisa (her first name only, per her preference for privacy) was a student at MORE and, like Babita, now volunteers as well. With her husband, Nafisa fled to Minneapolis from Somalia in 2000. “I couldn’t write, my writing was like a child’s,” Nafisa said, smiling sadly as she remembered her early years in Minnesota. “People would laugh at me and sometimes I would go home and cry.” She came to MORE to learn the basics and apply for jobs. Nafisa’s first job in the U.S. was cleaning office buildings. “They told me to knock on the door and say, ‘housekeeping,’ but my tongue couldn’t form the words!” she explained. Classes at MORE helped her through the daunting and overwhelming work of learning a completely new language and culture. Now she is a valuable, bilingual support for Friday food distributions. The Minneapolis-St. Paul metro area is home to the largest population of Somalis in North America. Somalis have been moving around the world for decades, but first arrived in the U.S. in large numbers in 1992 following the start of the Somali civil war. As families were resettled to the U.S. during this time of pain and readjustment, many looked to the Midwest for quick, reliable employment in its large factory farms. Word spread fast to other community members about Minnesota’s robust social services and job opportunities, and since 2005, Somalis have accounted for almost half of Minnesota’s refugee population. “It’s a little Mogadishu!” Nafisa said. 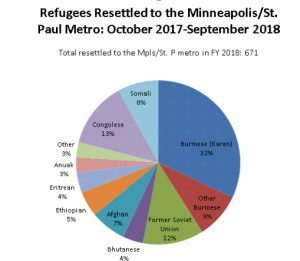 However, following President Trump’s executive orders in their various iterations (commonly referred to as “travel bans” or “Muslim bans”), Somalis accounted for just 8 percent of the people resettled to Minnesota in 2018. Now, the majority of people coming to Minnesota (41 percent) are Burmese, from Myanmar. 32 percent of these people are ethnically Karen, like Dee Pray. Most Karen people practice Buddhism, followed by Christianity and forms of Animism. Both its clients and its workers are relieved that MORE remains open. But MORE and other agencies realize they must do all they can to raise money, mobilize support, and adapt in trying times to stay viable. Robbins said that students and clients have been suggesting ideas to keep the school open. People have even started taking their neighbors to English classes to bring MORE’s numbers up. Over the holidays, community donors came together to provide linens, cookware and other household items for more than 1200 MORE clients. “The shift has been really pretty palpable,” Robbins explained. Before the lifesaving donation MORE received last October, each client consultation Robbins conducted “was like a grieving session.” But now, people are overjoyed and “hopeful,” he said, that they’ll be able to continue to get help from an organization they trust. Interested in donating to MORE and IIMN?